Fall menus seem to come and go as fast as Halloween on a weeknight. To stay festive and warm during the season, Au Bon Pain (ABP) shifted gears into a new holiday-inspired menu this week to give customers something new to get excited about. By switching up its offerings from Pumpkin Croissant and Harvest Pumpkin Soup to The Holiday Gobbler and Roasted Poblano Chicken Stew, this fast casual bakery café is staying ahead of the limited-time menu game. 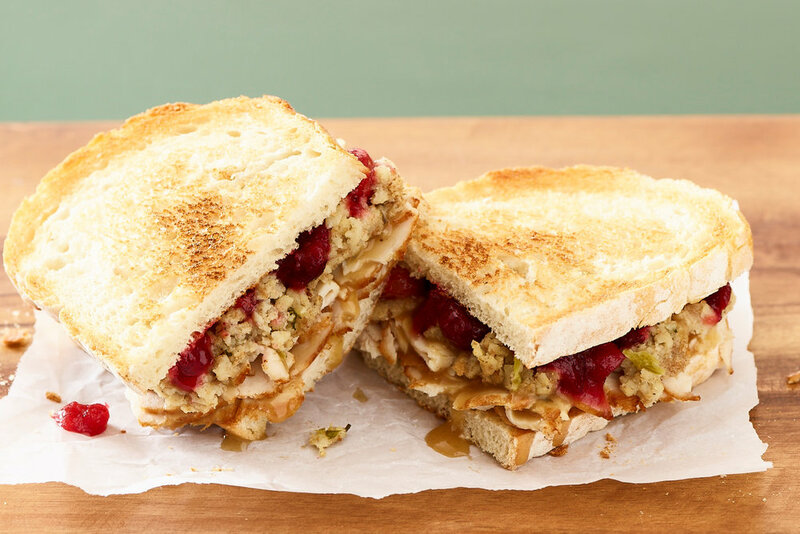 The Holiday Gobbler can be considered as a classic sandwich made up of Thanksgiving favorites like sliced whole turkey breast, classic stuffing with onions and celery, cranberry apple chutney, and drizzled with rich turkey gravy on toasted country white bread. However, for a real sweet and savory treat in the morning, try the French Toast Omelet Sandwich. It features ABP’s signature omelet made with parsley, chives, smoked paprika and roasted onions tucked inside a French toast bagel with maple cream cheese. Oh and let’s not forget the turkey sausage stacked on top of the omelet for some Thanksgiving nostalgia. Pair that up with a Butter Pecan Latte and you got yourself a Holiday pick me up. This menu is a fresh new take on previous holiday menus they have done in the past and it will only be available through Jan. 8 at participating Au Bon Pain locations. Customers can order ahead and pick-up orders through online ordering or ABP’s mobile app available in the App store and Google Play. Other menu items for this season, include; French Toast Bagels, Shortbread Tree Cookies, Gingerbread Cookies, Raspberry Filled Shortbreads, Pecan Meltaways, Mixed Berry Strudels, and Cranberry Crunch & Honey Parfaits.